You decide that you want a safer car to drive, or maybe your child is ready to get behind the wheel, and you want them to learn to drive in a safe car. But what exactly makes a car safe? 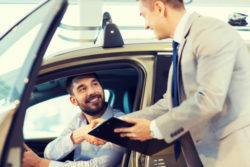 If you are looking to shop for a safe car, consider these three tips during your search. When looking for a safe car, make sure to remember that bigger cars are usually safer than a smaller one. In fact, nearly twice as many passenger deaths occur in small vehicles as opposed to bigger ones. This is because that in the case of an accident, the heavier car is going to move the lighter one. Even if it is the other car that hits the bigger car, the heavier car isn’t going to feel the same force of impact. Yes, this is actually a word. Essentially, it means the protection you get in your car assuming it experiences a crash. There are five main tests here; moderate overlap, small overlap, side, roof strength, and head restraints. These all combine together to give an idea as to how the car will do in the event of a car accident. Make sure to read up a little on the crashworthiness of the car you are looking to purchase. Many newer cars are coming with technology that is supposed to help avoid crashed altogether. One of the most common forms of crash avoidance lets you know when you are getting too close to the vehicle ahead of you. This is known as forward collision avoidance. While these are all tips that will help you pick a safer car, nothing is ever guaranteed. If you or a loved one has gotten into a serious car accident, make sure you have a highly experienced lawyer on your side. Consider contacting Stoloff Law, as our personal injury team will do everything possible to get you the best compensation for your case. Contact our offices today to schedule a consultation.